"Autonomous E-Maxx IR Tracking Testing." Pololu IR Beacon Transceiver Manual. 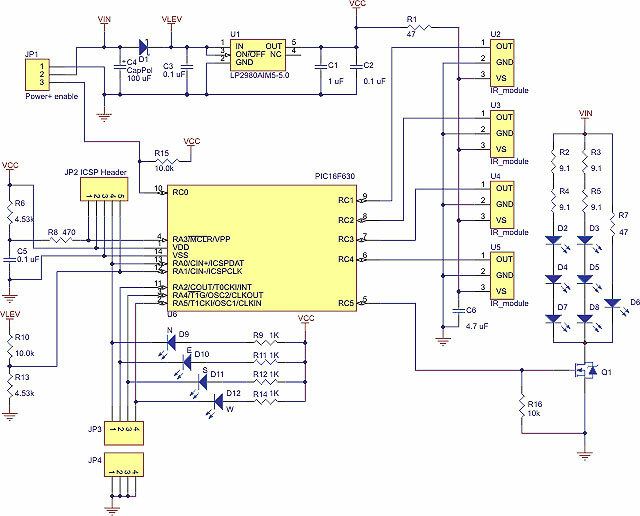 Pololu IR Beacon Transceiver Schematic. The Pololu IR Beacon Transceivers are devices meant to be used in pairs to give robots a simple mean for detecting each other. You can use the beacons to build pairs of robots that interact or chase one another or to make a robot that can identify and return to a home base. For example, you could build a "cat robot" and "mouse robot" that each have an IR beacon, where the cat chases the mouse and the mouse runs away from the cat. These beacons are ideal for autonomous robot contests in which robots compete in pairs. 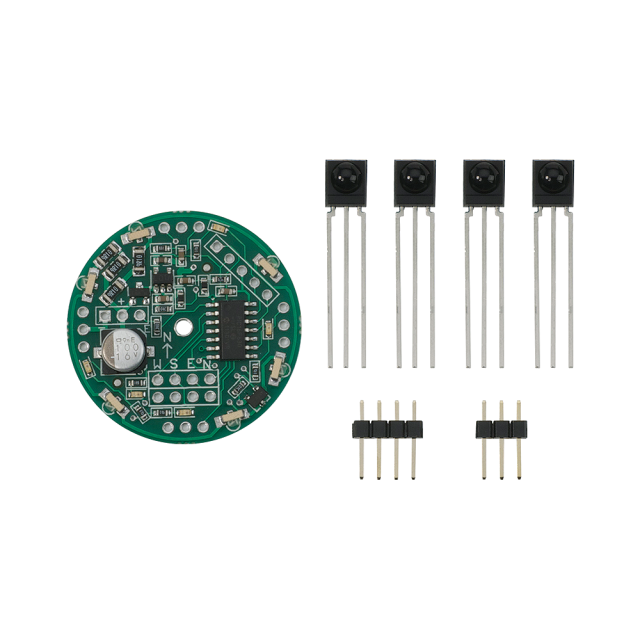 The new IR beacons feature round PCBs with six wide-angle emitters to provide uniform broadcasting in all directions. The on-board voltage monitoring enables more consistent output brightness over the voltage range. Most components are pre-assembled, so all you need to solder is the capacitor, connectors, and IR sensors (make sure you solder them in from the bottom of the PCB!). NOTES: The Pololu IR beacon is a kit; before using it, you need to assemble the beacon by soldering its components onto its circuit board. To use the kit in robotics projects, you need to connect it to your own robot controller. Please note that the IR beacons only work in pairs and that certain kinds of artificial lighting (e.g. 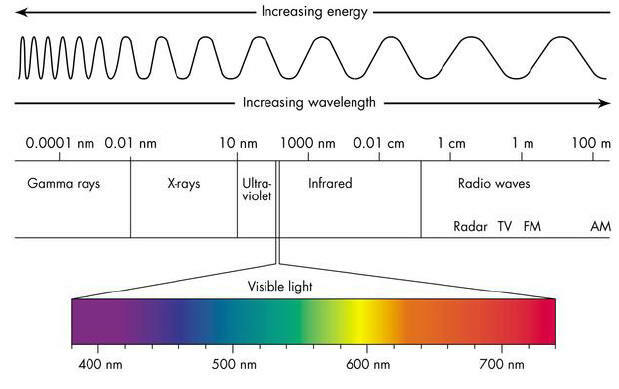 some fluorescent lights) can interfere with the sensors. How the IR Beacons Work? (The following animations show the old IR beacon, but the operating principle is the same in the new, round units). The transmission and detection cycle is carried out more than one thousand times per second, and a small microcontroller monitors all four detectors to decide the direction to the other beacon. The beacons have four red LEDs that indicate the direction to the other beacon; if you take two beacons and rotate them, the LEDs will always keep lighting up in the direction of the other beacon. Interfacing to the Pololu IR Beacon is simple - it has four digital outputs that indicate which of its four sides detects the other beacon the strongest. An enable input lets you select between active mode and a low-power mode. The Pololu IR Beacon Transceivers are devices meant to be used in pairs to give robots a simple means for detecting each other. You can use the beacons to build pairs of robots that interact or chase one another or to make a robot that can identify and return to a home base. These beacons are ideal for autonomous robot contests in which robots compete in pairs. The IR beacons feature round PCBs with six wide-angle emitters to provide uniform broadcasting in all directions. The on-board voltage monitoring enables more consistent output brightness over the voltage range. Most components are pre-assembled, so all you need to solder is the capacitor, connectors, and IR sensors (make sure you solder them in from the bottom of the PCB!). The beacons work by transmitting and detecting infrared light, much like a television remote control. The beacons alternate between transmitting and receiving so that they never get confused by reflections of their own transmissions. Interfacing to the Pololu IR Beacon is simple — it has four digital outputs that indicate which of its four sides detects the other beacon the strongest. An enable input lets you select between active mode and a low-power mode. Four on-board red LED's indicate the direction to the other beacon, enabling visual confirmation that the Beacons are "seeing" each other. Four digital outputs, each representing a cardinal direction. Four IR receivers and six IR emitters ensure a 360-degree coverage area. PCB Size: 1.35 inch diameter. Output refresh rate: 20 Hz. Detection range: 6 inches - 20 feet. IR Modulation Frequency: 56 kHz. Number of IR Detectors: 4.